What's Cooking in Granny's Kitchen? All things tasty are freshly made in Granny's Kitchen with a little bit of sugar, a little bit of spice, and a lot of love. Check out all our sweet and savory goodies below to see when your favorite Orchard products will be fresh for purchase. These sugared donuts are crunchy on the outside, and tender and moist on the inside. Our fresh-pressed apple cider is the key to their unbelievable flavor. They are sure to become a fall family tradition. Pair your apple cider donuts with a delicious apple cider slushie for a delicious duo. Mixing wine into cakes before baking is an age old technique to create moist, flavorful deserts. The wine's alcohol evaporates in the baking process, and most people who try our wine cake cannot pinpoint the unique flavor, but they usually ask for seconds. 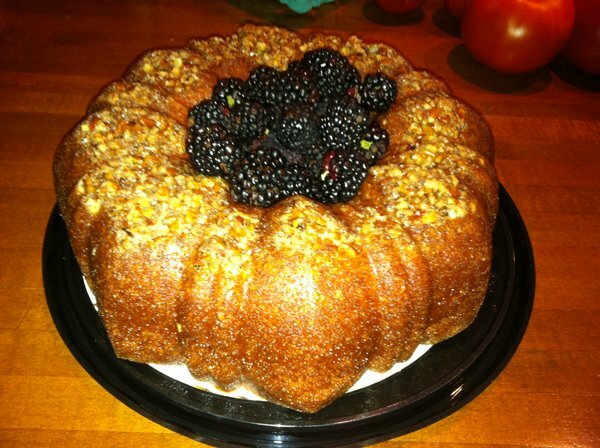 This cake works perfectly during the holidays, on a buffet table or in a picnic basket! It's very moist and has been our most popular bakery item since we opened. With its beautiful color and the sweetest flavor, our blackberry wine cake is an orchard favorite. Mixing wine into cakes before baking is an age old technique to create moist, flavorful deserts. The wine's alcohol evaporates in the baking process, and most people who try our blackberry wine cake cannot pinpoint the unique flavor, but they usually ask for seconds. This cake is perfect for all and any occasion! Comparing Apples to Apples.......Our Apple Cake is the Best!!! A moist dense cake that keeps well. In addition to apples it has pecans, coconut and after baking is topped with a warm buttermilk glaze. It has been a customer favorite since our bakery opened. The carrots and pineapple work together to keep this cake moist and wholesome. Topped with cream cheese icing and accented with pecans each slice is a thick, creamy, wonderful experience. Classic banana nut bread straight from Granny's Kitchen. Extra ripe bananas, walnuts and brown sugar are some of delicious ingredients that make this special. Great toasted for breakfast, used for French toast and warmed with ice cream for a yummy dessert. This lovely cake loaf is bursting with juicy sweet blueberries and infused with lemon giving it a nice citrus flavor. Topped with a hot lemony glaze just as it comes out of the oven. Perfect to enjoy any time of the day. An old fashioned apple loaf, slightly sweet and loaded with chunks of the freshest apples in season this bread is all about FALL! Wonderful toasted for breakfast, used for French toast, enjoyed with fall salads, or made into bread pudding. Very Berry, Peach, & Apple.......Our turnovers are baked not fried. The light and flaky crust cradles the delicious orchard fruit inside. Very Berry, Peach, Apple, Pumpkin & Pecan.......Our pies are crafted to perfection and baked fresh in Granny's Kitchen. Creamy & delicious...our fudge is homemade right in Granny's Kitchen. Last season, we began making our very own fudge, and we've been baking it fresh ever since. Our chocolate, chocolate walnut, and peanut butter flavors are sure to rock your taste buds .